I love photography – I love how it happens. First I find something that catches my eye. Then I work through what I consider attractive about it, and then I look at it again through the camera viewfinder, and if it still looks good, I take the photograph. Afterwards, when I look at the image to edit it, I may be seeing what originally caught my eye, or I may find something completely different. Maybe what I find is better than what I wanted. Maybe I can enhance the image in the editing process. In the end, making a good photograph is a process of satisfaction. At each step of the way, I have to be satisfied in order to continue working on it. And so, looking at the finished photograph is also an experience of satisfaction, for me the photographer, and also for the viewer who I hope enjoys what satisfies me. Oh, my! 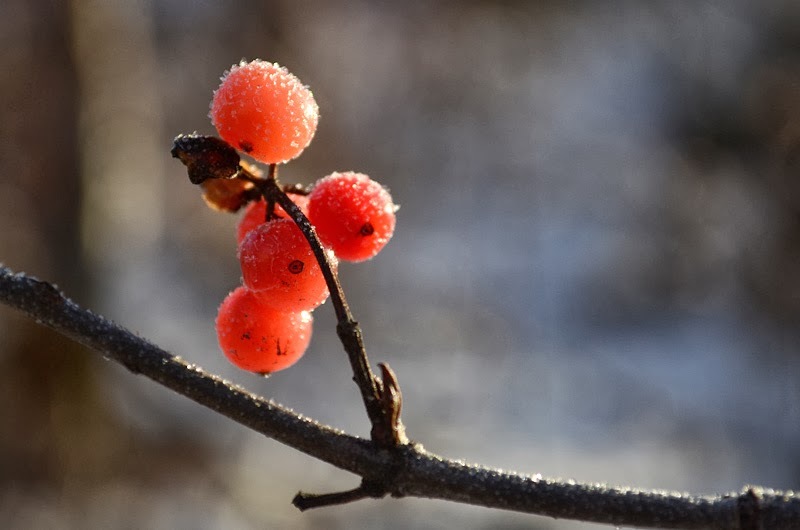 The frost crystals do look like sugar on the berries! What a fine winter treat this would be!